In 2010, myself and several social entrepreneurs and agronomists from Guatemala and the United States formed Semilla Nueva. Our mission was to find new growing techniques for Guatemala's grain farmers that could simultaneously increase incomes and rebuild soils. 2009 and 2010 had been turning points in Guatemala. One of the worst droughts in decades was followed by one of the worst tropical storms. Thousands were impoverished as an estimated 30 percent of the country's corn crop was destroyed two years in a row. 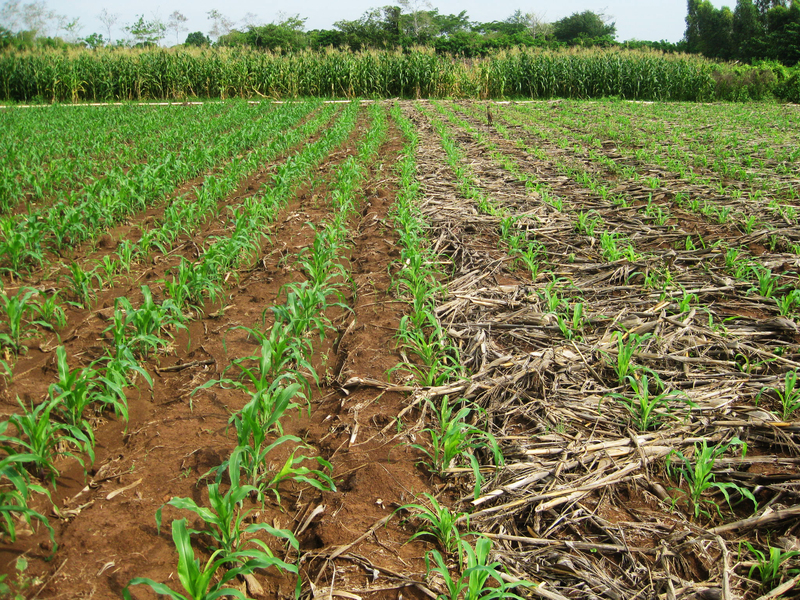 These losses could have been far less if Guatemala's soils had been healthy, but as the FAO reports, 79 percent of Guatemala's soils are severely degraded and lack resistance to these climatic events. During this crisis, as a budding organization we discovered CIMMYT's work on Conservation Agriculture. After reviewing CIMMYT's literature, email conversations with Dr. Ken Sayre and Bram Govaerts, and a brief visit to CIMMYT's office in Mexico, we decided that Conservation Agriculture techniques would form the backbone of our work in Guatemala. As a young organization, we were extremely dedicated to finding technologies that could scale and affect hundreds of thousands of families. Conservation Agriculture's focus on stopping field-burning, ending plowing, and using rotations and intercropping to rebuild soils -- combined with the economic results these techniques were bringing farmers -- was a perfect fit. Healthier soils are more resistant to the droughts and floods, and cutting plowing helps farmers save money in the process. These were changes farmers could make on their own lands to make a huge difference for themselves and the world. And in Mesoamerica, CIMMYT had already formed a foundation of decades of research, collaboration, and work directly with farmers. Semilla Nueva began their first tests in June of 2010. In June 2010, I was invited to take part in the annual course on Conservation Agriculture offered by CIMMYT, thanks to Dr. Bram Govaerts. Dr. Govaerts and retired CIMMYT researcher Dr. Pat Wall then joined Semilla Nueva's Technical Advisory Committee. From here, I returned to Guatemala with a new vision and we began working with farmers on side-by-side tests with these new techniques in the Pacific coast of Guatemala. The data we were collecting was exciting. Farmers increased their profit margin by about 10 percent in the first year on corn, but showed technical challenges in sesame, the region's second most important crop. Farmer adoption remained mixed, and we continued to work with CIMMYT's assistance to try new variations of Conservation Agriculture that could solve this problem. In 2013 we purchased an experimental farm, and with the guidance of CIMMYT's platform manager, Rachael Cox, designed the first experimental platform dedicated to Conservation Agriculture research in Guatemala. During this process, our team paid close attention to the unfolding of the new and growing MasAgro program in Mexico. This collaboration between the Mexican government and CIMMYT, with its aim to scale the reach of Conservation Agriculture technology to every grain farmer in the country, was a constant inspiration to improve progress and to have ambitious goals for impact in Guatemala. Armed with data, connections, and ambition, I took an opportunity to meet with Dr. Elias Raymundo, the director of the Instituto de Ciencia y Tecnologias Agricola (ICTA), the Guatemalan government institution in charge of agricultural research. Over two hours of coffee, Dr. Elias and I realized that we had very common goals and had met at a very opportune time. The ICTA ran 14 experimental farms in Guatemala and was in the process of increasing its reach in Guatemala and discovering new sustainable agriculture techniques. We had strong experience with CA systems and a relationship with CIMMYT that could help guide the expansion of CA research throughout Guatemala. The context was incredibly exciting. The Guatemalan government was undertaking its biggest expansion of the farmer education system in nearly two decades, and there was a growing realization that better research was needed to come up with the techniques that could truly help farmers. Meanwhile in Mexico, the MasAgro program was showing how powerful CA techniques could be and how to connect institutions from various sectors in a unified attempt to spread the technology. There were the opportunities and the tools. Dr. Elias Raymundo and I decided that the next steps would include sharing experience on the CA progress made in Guatemala, visiting CIMMYT to learn about their progress, and if all went well, design a research program for CA in Guatemala to cover the whole country. The first approach at Conservation Agriculture for Semilla Nueva took place with Brom Govaerts in 2010. After several meetings and field visits, in November 2013, we piled 10 researchers into two cars and took off from Quetzaltenango, Guatemala at 4am on a Sunday. Most had traveled the entire day before to reach this meeting point. Due to road construction and police interference with paperwork, the estimated 17-hour journey took nearly 27 hours. We arrived an hour before their first 8am meeting with the CIMMYT team, just enough time to shower and drink a cup of coffee. The visit highlighted CA techniques, data gathering tools, the institutional mechanisms that were making MasAgro function, and on-field trials. By the last day, the ICTA and Semilla Nueva presented now deputy director of CA for MasAgro, Dr. Bram Govaerts, with a proposal for CIMMYT's official assistance to design a CA research program in Guatemala, with the future goal of replicating some of the biggest advances of MasAgro. A week later the Guatemalan Minister of Agriculture, upon learning of the results of the trip, made an official request to the Mexican Embassy for their help. The answers were both yes. By February, 2014, Victor Lopez and Rachael Cox from CIMMYT were in Guatemala. Over a week we designed research protocols for nine additional research platforms, covering the majority of Guatemala's agricultural zones. Between March and May of 2014 these platforms began, with tailored CA tests in the dry hillsides of Zacapa to the heavily industrial Pacific coast, to the indigenous and traditional areas of the highlands. With Semilla Nueva continuing to refine its farmer education methods and the ICTA testing the technologies to educate throughout the country, we are poised to build our own national program soon. These results have been due to the leadership and vision of the ICTA, including the whole CA team and especially Dr. Elias Raymundo, to the investment that CIMMYT and especially Dr. Bram Govaerts made at a very early time. For CA to have a future in Latin America it will take more work on collaborations just like this one, more NGOs, governments, and research institutions coming together with a common purpose to solve a common problem. We're proud of the progress that is just starting to happen in Guatemala, and look forward to the years it will take to transform it into something much bigger. Interested in learning more about Semilla Nueva and the progress we have made with Conservation Agriculture in Guatemala? Follow us on Facebook and Twitter. Want to get involved? Sponsor a Family Farmer so he or she can participate in Semilla Nueva's Conservation Agriculture programs! A Spanish version of this article was first published in Enlace Magazine, Mexico's leading review of sustainable agriculture, in August 2014. View it here. 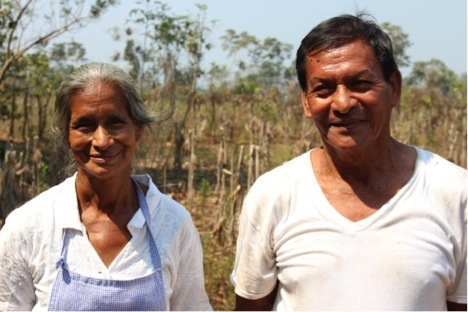 Juana Alvira and her husband, Semilla Nueva participants, smile proudly as they stand on their no-till plot of land.